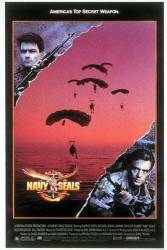 Continuity mistake: Near the end of the film, when the SEALs are in the inflatable boats heading towards the coast of Beirut, there is a shot from behind showing all the SEALs wearing black diving suits. But when the shot changes to a close up of their faces, you can see they are wearing camouflage fatigues, not diving suits. Factual error: At the end of the movie when Hawkins is cutting the guy's throat underwater no blood is visible. Factual error: Hawkins pursues the flatbed tow truck that has towed away his car. He climbs aboard and uses the controls to tilt the bed and tip his car onto the road, then drives it off. He missed an important step; vehicles on a flatbed are chained down fore-and-aft for security, and at no time did we see him release the chains. Factual error: When the seal team was in the Middle East kidnapping the guy for information, right before Graham was killed someone called Hawkins by his name over the radio not his code name. If the radio was being monitored that would give away the identity of one of the team members that is why they use code names. Factual error: In the hotel room scene Sheen and the reporter are in the room in Virginia beach, VA, there are ships in sight out the window. The ships in the background are at a private shipyard called Metro Machine which is directly across the Elizabeth River in Downtown Norfolk, 20 to 25 miles from the oceanfront. Continuity mistake: When the team was trying to get out of Beirut and the green car that they were in flips over. The first time you see Hawkins starting to crawl out he has blood on his neck the camera cuts away then the next time you see him the blood is gone. Factual error: Enlisted Navy personnel wear the collar of their Service Dress Blue jumper inside of their all weather coat. It is not the case in Chief's funeral scene. Continuity mistake: In most instances where the Team Leader is shown close-up driving his jeep, you'll see him working the steering wheel like some 50's movie. But the full-shot views will show him with no free-play on the steering wheel. Pilot: Lieutenant, you guys are incredible. Thank you. Curran: There's no reason to thank us because we don't exist. You never saw us. This never happened. Hawkins: One more thing: you're welcome.